A dramatic shift took place in the high altitude slots of the national rankings, this weekend. 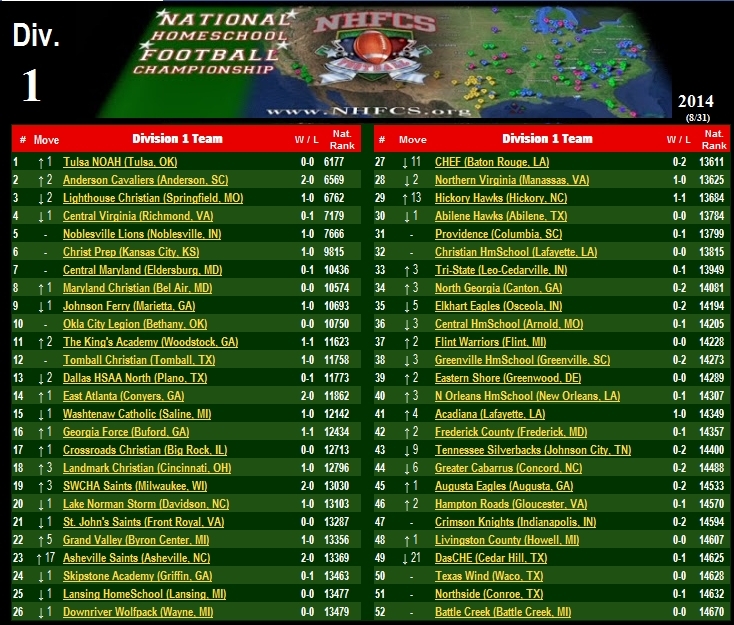 Tulsa NOAH backed into the top spot while awaiting the first week of Oklahoma prep competition. This was in large part due to a less-than-expected performance in Springfield Lighthouse's opening game as the newest team to play in the Missouri High School League (guest status). Lighthouse played a dominating game but the score didn't know that. Anderson Cavaliers convinced the Freeman Scoring computers by shutting out their first 2 opponents. They racked up an accumulative 103-0 in the scoring differential. This was enough to leap over the Richmond Disciples who played better than expected against an elite Virginia powerhouse, and remained essentially stationary in the national ratings. The West Region is continuing a strong presence at the top, holding 6 of the top 13 slots. A proud moment is also worth noting for the younger organizations of the North. A more subtle factor that is emerging in the top 20. For the first time, the Northern Region has 5 teams in the top 20! Members of the Lighthouse Chargers (Springfield, MO) have notified the NHFCS of the passing of a dedicated coach, Chris Bowen. Last night, Coach Bowen was rushed to a hospital with a likely heart attack. He was pronounced dead, in the early morning hours. Many of his team and leadership were with him during the final moments. Chris spent several years training the boys, focusing primarily on lineman development. His team is consoling one another during this loss, and appreciates the prayers and support of all their football & community friends. 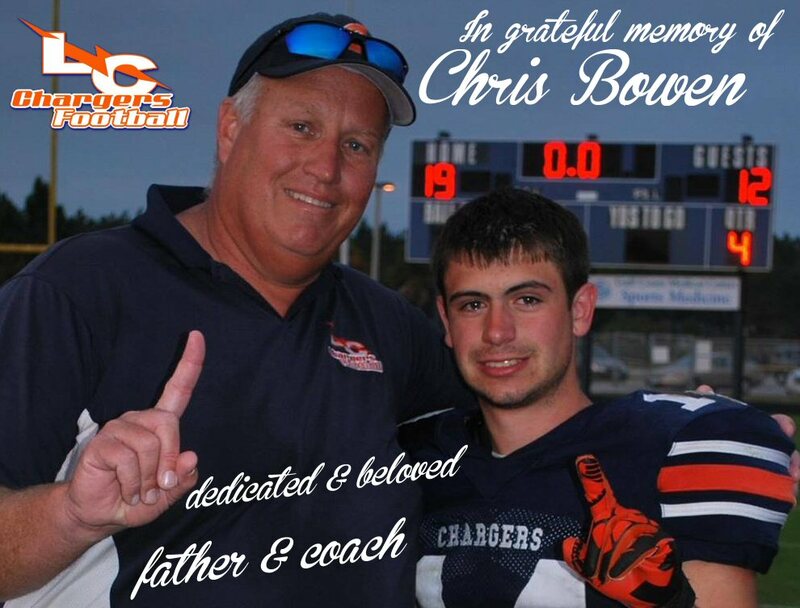 Chris was recently joined on the Charger coaching staff by his son, Brady Bowen. Brady was an influential player on the 2013 National Homeschool Championship team. As a recent graduate, Brady assumed an associate role with the Lighthouse coaching staff. Chris is survived by his wife and 2 children, all of whom were deeply involved in the Lighthouse homeschool organization. "I'd do just about anything to flip one more tire for one of the greatest and most influential coaches I have ever had. I will forever cherish the time I had with Coach Bowen, and I know all of my fellow high school teammates feel the same way. Coach Bowen was the epitome of a coach who would go the extra mile to ensure the well being emotionally, physically, and spiritually of a player. He was a great man, person, and role model. I'll never forget the conversations we had together. He will be missed by so many."